The Little Yellow Cottages are a Port Austin favorite. They are perfect for those that desire activity and comfort. The Little Yellow Cottages consist of a block of six one and two bedroom cottages located in Downtown Port Austin. Across the street you will find the Port Austin marina, beach, and pier. The cottages themselves are ideal for both small groups requiring just one cottage or larger groups needing more room, yet seeking the privacy afforded by the individual cottages. Each of the Little Yellow Cottages feature a screened in porch, a living room with TV and soft seating, a full kitchen and a private bath with shower. Cottages are available in both one bedroom and two bedroom configurations and can accommodate up to six guests. Outdoors you will find a fire pit, outdoor grills, and a picnic table and chairs. You are welcome to enjoy the space outback as well as your own private patio. You can purchase wood, charcoal, and other essentials for your outdoor fun just a few minutes from your cottage. We have 4 two bedroom cottages, 1 one bedroom cottage, and 1 studio cottage for rent. The cottages have been recently updated, and all have air conditioning. Each has a full bath, fully stocked kitchen (plates, bowls, utensils, pots/pans, etc. ), living area, TV, DVD, and a small screened in porch. The two bedroom cottages each have one bedroom with a queen or full size bed, and one bedroom with two twins. The new studio cottage has 1 queen sized bed, 1 queen sized sofa bed, large screen TV, fireplace, and a large front and back deck. The cottages sit in a large yard that includes 3 charcoal barbecues as well as 1 gas grill, a fire pit, picnic tables, and chairs. To see more information on each cottage, click the links below. While staying at the Little Yellow Cottages you will be just steps away from all Port Austin has to offer. Just a block from the Port Austin Shoreline and Downtown. Only seconds away from the beautiful downtown area, you can shop and dine at many of the local area businesses. On Saturdays you can enjoy the Port Austin Farmers Market. Just a few short steps from your door you can browse local hand made crafts, artwork, flowers, as well as delicious fresh produce! Take a quick walk towards the shoreline and you will find a beautiful marina and beach. Explore beautiful Lake Huron by walking the shoreline, renting a few kayaks, or even fishing! Other outdoor activities nearby include horseback riding, hiking, and golfing. Visit the historical center and get to know a little more about the history of Port Austin. With so many different things to do, Port Austin has something for the whole family to enjoy! Bring your bike (or rent one nearby) and everything in Port Austin is just seconds away. The Port Austin Farmer's Market is across the street every Saturday! See the cottages in the background? The Port Austin waterfront is mere steps away! Want to visit Turnip Rock during your stay at the Little Yellow Cottages? 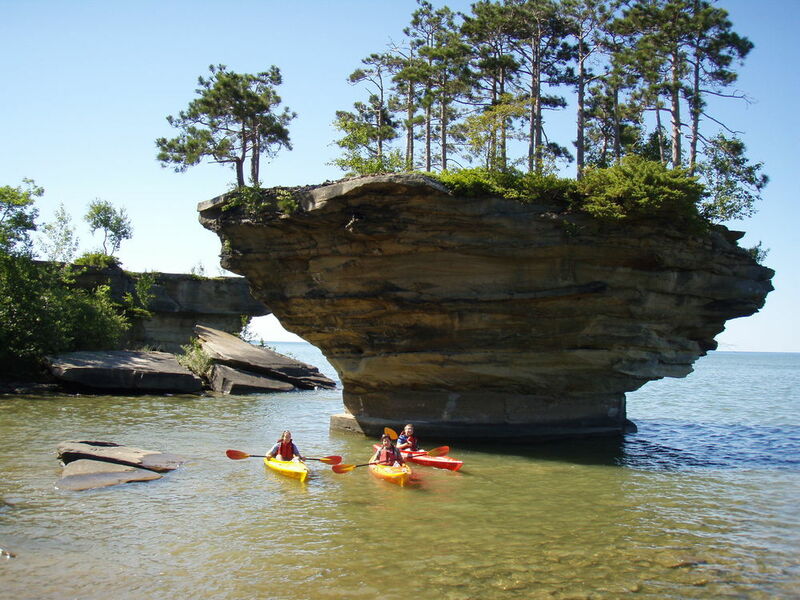 Take the short walk over to Port Austin Kayak and rent a kayak to experience one of the natural wonders of Michigan! You can also kayak out to view the Port Austin Reef Light, Point Aux Barques, or other area attractions on Lake Huron. Little Yellow Cottages are open all year! Port Austin is not just a summer destination! Year-round there are plenty of activities and adventures to be had. From the beautiful fall colors to the peaceful winter snow, there is still so much to enjoy. During the fall, take a drive around the thumb and enjoy the beautiful colors or hike the nearby nature trails to get an even closer look. With winter comes a whole new world, one that is much more relaxed and peaceful. Gaze upon the glistening snowy shores and water and enjoy Port Austin in a more peaceful setting. Participate in a wintertime outdoor activity like ice fishing, snow shoeing or snowmobiling. As spring approaches, watch the town begin to wake up and the beautiful birds return from their southern winter vacation. Whatever time of year, Port Austin has plenty of fun and adventure to offer. If you don't know, you need only ask one of the friendly locals about town.